The 5 Ways to Wellbeing help you achieve a positive body and mind. ‘5 Ways to Wellbeing’ introduces you to five simple and easy ways to improve your mental and emotional health that are based on research. A healthy mind is just as important as a healthy body for your overall wellbeing. Like physical fitness, you can strengthen your mental health in lots of small day-to-day ways. This will help you live a happier and a longer life as well as help you to cope with stress. The links below give you easy tools and info so you can discover how to make the 5 Ways part of your ways to wellbeing. Everyone can ‘try the 5’ at home, work or during study. It costs nothing and it’s easier than you think! Building relationships with others will support and strengthen you every day. Relationships aren’t limited just to your family; they include your friends, neighbours, co-workers, school friends and people you meet in your local community. Take notice means being aware of what you are feeling or seeing. Be aware of new sights, smells, and sounds as you go about your day. Try it as you walk, eat lunch or wait for a bus. Focus on the ‘here and now’ and take notice as it can help you feel calm and reduce stress. 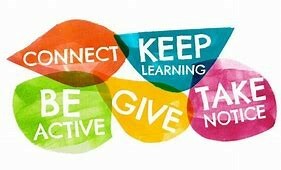 Being active is one of the key 5 Ways To Wellbeing. There are plenty of fun ways to keep active, such as going for a walk or run, playing sport, dancing, riding a bike or even gardening! Doing something every day will make you feel good and clear your mind! Help others by giving your time and doing something nice for a friend, or a stranger, including thanking someone, smiling, volunteering your time, joining a community group or looking out, as well as in. Seeing yourself, and your happiness, linked to the wider community can be very rewarding and creates connections with the people around you. Learn something new often. To keep learning can mean you: try something new, rediscover an old interest, sign up for that course, take on a different responsibility at work, fix a bike or learn to play an instrument or how to cook your favourite food. Set yourself a challenge! Learning new things will help make you more confident, as well as being fun.